Panel Built’s steel line fabricates powder-coated steel mezzanines and stair systems to your custom specifications – with custom sizes, heights, spans, decking materials amd landings. 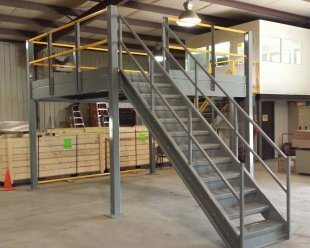 a cold rolled mezzanine from Panel Built, Inc. offers a durable platform for many different applications including material storage, working and sorting platforms, or add a modular office to create a manufacturing observation room. Panel Built roll-formed Mezzaines are lightweight, yet heavy-duty enough to support 10 psf loads. Constructed out of structual steel columnsand roll-formed c-channel, these mezzanines come completely pre-fabricated and ready to assemble. For applications where higher live loads or greater clear spans are required, Panel Built can design a hybrid system which makes use of structural columns and beams as well as roll formed chanels to accomadate the special needs.